Holding an old plastic bottle filled with water and a long stick, Rajesh is ready to perform his first meaningful task of the day. The sun is yet to rise and Rajesh heads to a bushy land where he will use the water to clean himself after defecating and the stick is to defend himself from any animal. I am in Phula Bai Kheda village in Panch Dewal panchayat in Rajsthan’s Sirohi district. It is a habitation of 500 families, most of who belong to Grasia tribal group. I ask Lekha, Rajesh’s wife, if there is a toilet in the house. She murmurs that they were planning to construct one soon. About 150 toilets have been constructed in this village under various schemes. We walk to the next hamlet where there is some toilet infrastructure in place. The toilet in Raiji Bai’s house is a dumping ground for everything except to take a dump. After walking a few more metres, we enter the house of Masro Bai that has a functional toilet. But only two of the 10 people in the house use it. I drive further to Damra Ki Phali hamlet. There are 20 families here, of which four have toilets and three are in use. I ask Parti Bai, a resident of the village, about why the toilet was constructed. When I ask if she thinks it is important, she says yes. “Otherwise, we go to the farms and they become dirty,” she adds. I next drive to Kalabur village, where about 220 families of Gracia live and 21 toilets have been constructed, but only one is in use. A group of women are sitting in the Anganwadi Kendra for a self-help group meeting. I join them and with my translator for a chat on sanitation and hygiene. None of them have toilets in their households. However, they feel toilets can have a definite value. Snakes and bear frequent the area and so it is quite unsafe to answer nature’s call in the dark. Toilets would lessen this risk. Some women also talked about honour and then the discussion flittered to animal and reptile encounters of the past. When I raised the issue of open defecation and its link to health hazards, the reaction just drew a blank. After this interaction, I walk up to Rupi’s place, the only household in the village which uses a toilet. I ask the family why they use it and others don’t. 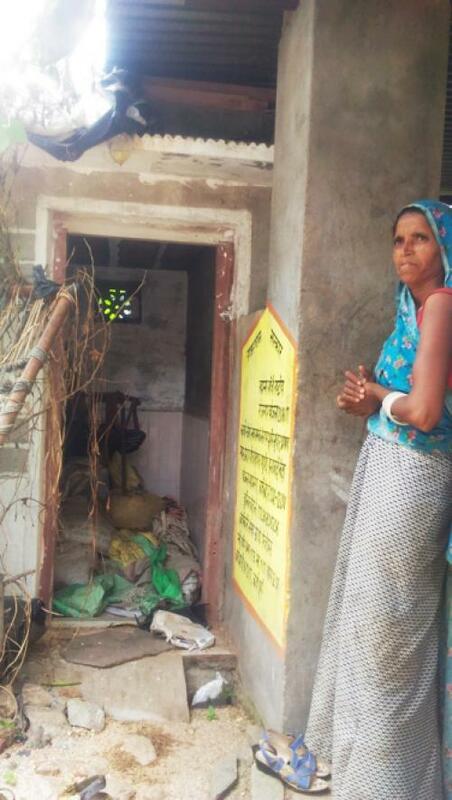 They did not have a definite answer but her two daughters say toilets save them a lot of hassle. We then climb a small hillock in the village. Padma and her families live here. Their toilet has been used only once or twice. “If we go in the jungle, half a litre of water is sufficient. For toilet, we need at least three litres of water. There is not enough water in the village,” says Padma. Next is a school, which is squeaky clean and has separate toilets for boys and girls. Students no more sneak out to urinate or defecate during class hours which used to happen two years ago. “Old crumbling toilets were renovated two years back with proper water supply. We also have a facility for clean drinking water. Sanitation is a regular discussion after school prayers,” says school headmaster who has been at the forefront of this change. The next day we drive to the panchayat of Nitoda, which is 5 kilometres from the block capital of Swaroopganj. Part of this panchayat, adjacent to the main-road, is a semi-urbanised area with decent concrete houses. Every house has a toilet here and everyone uses them, a rarity in this district. We then drive for about a kilometre. Stop at the first hut we see, which surrounded by moderate vegetation. As we enter the gates, we are greeted by a small lump of faeces. A dysfunctional toilet is nearby, which obstructs the collection of cow dung for the household. According to the United Nations International Children's Emergency Fund (UNICEF), one gram of human faeces may contain 10 million viruses, 1 million bacteria, 1,000 parasite cysts and 100 parasite eggs. I decide to leave the 500 million viruses undisturbed and explore the rest of the village. The story is a repeat of the previous two villages: lack of toilet infrastructure or poorly constructed toilets, minimum level of awareness on the linkage of open defecation and poor health indicators and low usage even where infrastructure is in place. The door of the anganwadi is closed for the day but the door of the only toilet there is perpetually open. The toilet does not have a pit connected to the outlet and has never been used. Next we travel to the village of Manduwa. Open defecation is also a norm here even when there is a fully functional toilet. It is inside the house and is used as a washroom. We are intrigued. Pooja (name changed) wanted to be a part of a scheme four years back and the prerequisite for that was a toilet. So, a toilet was indeed constructed but has never been used for defecation. “Jungle main acha lagta hai, aaraam hai (Jungle feels nice, it is hassle free),” is the reason she gave. Open defecation has resulted in an endemic health hazard in India. About 1.4 million children in the world die every year due to diseases caused by it. Nearly 950 million people defecate in the open, more than half of whom are in India. The health impact of this is astounding. As many as 117,000 children under the age of five die every year in India due to diarrhoea. Compounding the situation, infected intestines not only leads to an array of diseases but also does not support the absorption of nutrients and medicines well. This leads to a vicious cycle, underweight women give birth to underweight babies who suffer from poor health. In 2016, 39 per cent of Indian children under the age of five were stunted. This visit to Rajasthan presented a pretty gloomy picture on open-defecation free status in a district that is touted to be an example for the rest of the state. Four distinct issues emerged for the lack of sanitation and hygiene in these villages (and the block): no or poorly constructed infrastructure, entrenched behaviours and traditional cultural practices, low awareness on the impact of open defecation on health and lack of water or supply to keep the toilets clean. The other aspect is obviously that governance and nobody I interacted with knew about the existence of Village Health Nutrition Water and Sanitation Committee (VHNWSC). This decentralised committee, which comprises sarpanch, ward panch and members of the community, receives funds for awareness on sanitation and maintenance of hygiene in the village. In all four villages, my interaction with children was the silver lining. Children are much more aware of open defecation and its pervasive impact on health. Government schools have played a pivotal role in bringing this change. Also, the fact that there is some level of discussion in the community on toilets despite failing to draw the linkage of toilets and health is also a positive sign. Anyone who has worked in communities, especially rural communities, will acknowledge that this is a significant shift. I head back to Delhi in an overnight train and the tracks are lined with men with plastic bottles and blue mugs in hand. Women prefer the early hours. The houses near the tracks are cluttered one over the other. This urban landscape is entirely different from the villages of Sirohi but the problem remains the same. Even Delhi is not ODF. And in all likelihood, neither Sirohi nor Delhi would be ODF anytime soon. The need then now is a more strategic engagement with communities in both towns and villages. It will take another five or 10 years, maybe even more, before India can be ODF. The behaviour is too deep rooted and the infrastructure too dismal. While declaring ODF districts looks good on paper, the real battle to clean India has only started.